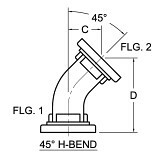 ATM manufactures wide variety of bends and mitered waveguide assemblies specially designed for every customers unique requirements. 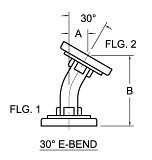 We manufacture 30°, 45°, 60° and 90° waveguide bends as well as 90° miters in both E & H waveguide to accommodate most typical RF microwave applications. 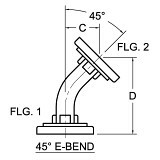 Custom Bend Waveguides are available for more complex RF systems. 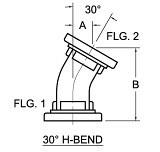 For more information please call us to discuss your requirements for E & H Waveguide Bends / Mitered Waveguides with one of our design engineers. VSWR: 1.05 Typ., 1.08 Max.